N.B. It happens that people want to make pictures of your poster. 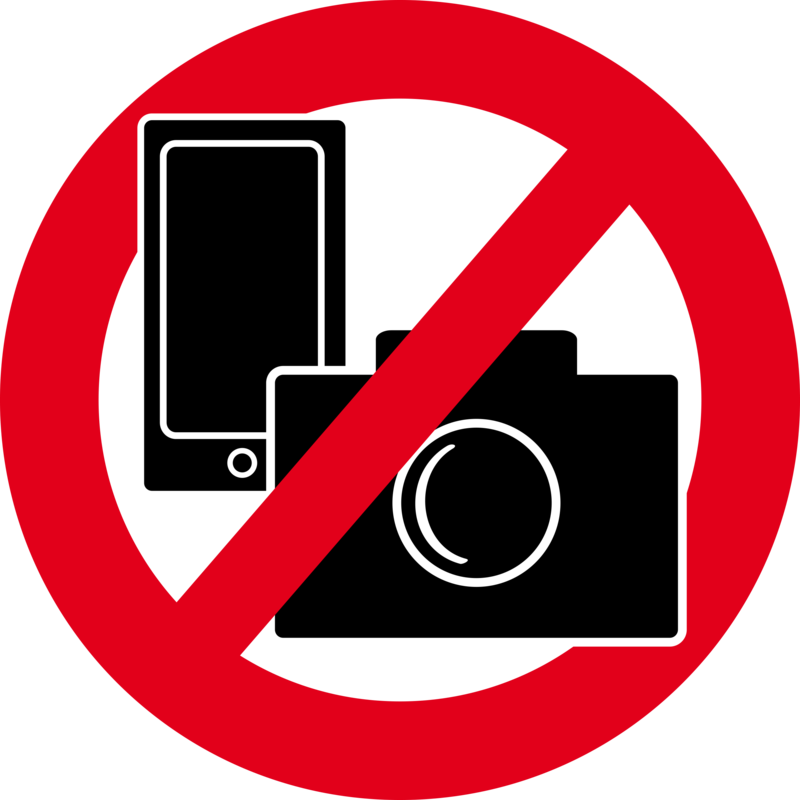 We would like to protect your privacy and your research; if you do not want people photographing your poster, please include this image in your poster, and ensure it will be clearly visible at the top of your poster. Posters will be on display for 2 days of the conference, either Monday and Tuesday, or Thursday and Friday. Authors are requested to ensure that the poster is on the allocated poster board by 10am on the first day and are removed at the end of day 2. Those not removed by this time will be disposed of by the event coordinators. Authors are requested to be present at their poster during their allocated poster session. A freestanding compatible poster board will be provided for your poster. Your poster number will appear on the top right hand side of the board so you can locate your board easily. You have also been invited (by our e-poster company Morressier) to contribute to our e-poster database by uploading your poster. Note that this is in addition to your printed poster (except for the sessions 'Synthetic microbiology: principles and engineering' and 'Importance of glycobiology in microbial interactions'). Delegates will be able to view your poster in our e-Hub on screens and tablets. Poster size should be A0 portrait oriented (width: 84.1cm / 33.1 inch, Length:118.9cm / 46.8 inch). Do not exceed these dimensions. The poster board itself will be 100 (w) x 250 (h) cm. Apply the KISS principle: ‘Keep it Short and Simple’. Avoid putting too much text and figures on the poster. Your poster is a visual aid to present your work. It should contain max. 350 words, preferably less. Visual elements such as graphs, diagrams, figures should dominate. Use a light colour background and dark colour letters for contrast. Use 2-3 colours and avoid overly bright colours. Your poster should help you convey your message. Prepare a poster presentation of 3 minutes in which you tell your audience your objective, hypothesis, method, results and conclusion. Be prepared to provide more information to those who ask specific questions. The title should be at least 100 pt, font size the text on the poster at least 36 pt. Don’t mix fonts, chose one font for all text blocs in the entire poster. You may wish to use a second font for title + headings and figures and tables. Use text sparingly. Your poster is not a paper, and there is little time for visitors to read. Let the graphics speak. Use columns of max. 70 characters (including spaces) width. Avoid large blocks with text and long sentences (<10 sentences per block; <50 words per block). If possible use bulleted statements rather than blocks of text. Avoid abbreviations. When abbreviations or codes are necessary, keep them as simple as possible. Choose the line spacing such that the use of sub- and superscripts will not affect the layout of text blocks. The introduction should contain 3 to 5 sentences outlining essential information necessary to understand the study and why it was done. The objectives of the study, the research questions or the hypothesis should be clearly stated in as few words as possible. Outline your methods briefly, as short and general as possible. Results should be presented preferably as graphs. They should be self-explanatory and therefore please provide a clear legend including symbols. You may also want to provide an interpretation of the results below each panel. do your findings confirm your hypothesis? Figures are highly preferred above Tables. Graphs or tables should be self-explanatory and therefore please provide a clear legend including symbols. Put legends above a table and below a figure. Keep legends short (10-25 words). Properly label the x- and y-axis of graphs, include units. Keep graphs as simple as possible. Include the results of statistical analyses (significance levels) in the graphs by using discriminating letter codes (a, ab, b) or asterisks (*, **, ***). Do not use Tables that contain more than 20 items. Complex data should not be included in your poster but may be provided in a separate information sheet. Do not give more decimals than necessary to show meaningful variation. Gosling PJ 1999 Scientist’s Guide to Poster Presentations. Kluwer Academic / Plenum Publishers, New York, USA. Malmfors B, Garnsworthy P and Grossman M 2000 Writing and Presenting Scientific Papers. Nottingham University Press, Nottingham, UK. It is possible to have your poster printed in Leipzig. Copy now!, just south of the city center, can provide poster print services; they will offer a special ISME17 price (€10), if you indicate you’re attending ISME17. You can either send the your poster file by email in advance and pick it up later, or come into the shop and print it immediately. Printing will take 15 - 30 minutes. Please take their opening hours into account. Printer shop - Copy now!